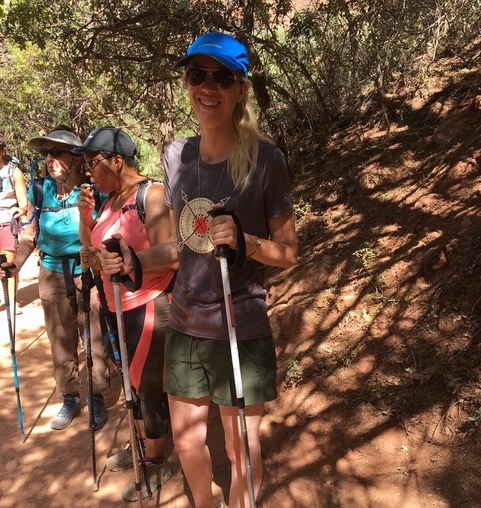 Larissa Wiens, one of our Freedom Challenge participants in Bryce-Zion in June, shares her story of learning to fully rely on God, even when what he's asking us to do seems almost impossible! When I signed up to be part of the Prayer Team on the Bryce/Zion Challenge this past June, I didn’t know what God was going to do, but considering it felt like a miracle for me to actually be going, I was very expectant. It felt like a big step forward for me to say ‘yes’ to this challenge, as just to physically travel there was something I knew God was going to have to really help me with. Three years ago I got very sick. From that time I have been on an interesting journey with God, where I have learnt to remain thankful despite 24/7 (and many times unbearable) nerve pain. My ‘work’ since 2013 has been in Zambia with Operation Mobilization (of which Freedom Challenge is a part), developing a skills training and discipleship center for vulnerable and marginalized women. However, last year the pain from nerve damage became so debilitating that I had to return to Canada for further medical care. Throughout the past year there were many times when I didn’t think I would ever be pain-free enough to be able to walk beyond five minutes at a time. If it wasn’t for Jesus, I really would have lost hope. When a trial starts to span a few years, there may be moments when we start to shift our eyes onto ourselves and our weaknesses, rather than onto God and who He is. I think that is what was starting to happen with me, but God had a plan. Throughout different types of involvement with the Freedom Challenge over the last number of years, I have always seen how God is not only using the movement to bring healing and hope to those who are oppressed around the world, but also to each of us who say ‘yes’ to participate in the challenges. I knew God wanted me in Utah for this challenge, maybe even for a boost forward in my own healing journey. Being part of the prayer team was so amazing, but after the first few days of the challenge I had the urge to experience God on the hiking trail…but how would that happen? A few minutes after having that thought, I somehow found myself in conversation with one of the hiking guides. She said to me “So, are you going to join us on the trail tomorrow?” I felt a surge of nervous excitement go through me, but proceeded to remind her that I am on the prayer team and am still recovering from a recent back surgery. I said I feel God might be asking me to try hiking, but I have not yet walked for more than about 20 minutes at a time, and would really hate to slow the whole team down just because of me. That didn’t seem to bother her, she was so gracious! It almost felt surreal. I had zero fear, just expectation. My mind was focussed on God and his strength. I didn’t know how I was physically going to hike the next day, but I knew that taking this step of faith was an act of obedience, and that He would make it happen. So there I went – I ended up hiking with the beginners group for a total of almost five miles. This was a miracle! It was an incredible day, where God proved that if we stay focussed on Him, he will keep showing his power through us. I realized that if I had doubted God and let fear control me, I probably would have not made it very far at all. Each step that I took turned into an act of worship. It was so rewarding to totally rely on Him to give me the power to keep going beyond what my body was previously capable of. I am still on the healing journey but will not forget that day and how I experienced our faithful God walking with me. During that Freedom Challenge God really blessed me with a deeper understanding of His love for me, plus physically blessed me with a boost forward in my healing. I am SO thankful I responded to His invitation to go! Through this journey, especially in the chapters of much challenge, I am reminded to continue walking faithfully together with Him, to be obedient and trust the route He’s taking me on even if I do not fully understand ‘why’ – this is when it gets exciting! Larissa Wiens is a career missionary with OM in Africa. She grew up on her family farm in Saskatchewan, Canada, but after spending the last five years in Africa has found Zambia to be her second home. Empowering vulnerable and marginalized women through skills training, discipleship and small business is where she finds some of her greatest joys. Yet in the midst of great joy and exciting adventure in Zambia, sickness and pain have more recently added a new chapter to Larissa’s story. Despite the challenge, she is fuelled by ‘answering to His call’, even when it seems to be humiliating and impossible.